Olbas Pastilles, 1.6 oz Box (27 Lozenges) - Penn Herb Co. Ltd.
Olbas Pastilles are long lasting, maximum strength cough drops that provides instant, cool soothing relief for sore throats and fight coughs. ACTIVE INGREDIENT (in each drop): Menthol 10 mg. Inactive Ingredients: Chlorophyll, Clove Oil, Eucalyptus Oil, Glucose, Juniper Berry Oil, Modified Starch, Sucrose, Wintergreen Oil. Note: Modified starch is either non-GMO maize or tapioca starch. NO corn, wheat, or rice is used in the formula. 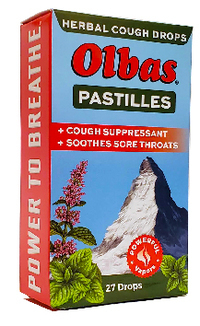 Olbas Pastilles are vegetarian friendly and contain NO honey, NO animal products or byproducts. Soothes sore throat & fights coughs due to common colds and inhaled irritants, such as smoke; natural anesthetic action that provides cool, soothing relief for sore throat. Adults and children 3 years of age and over: Allow pastille to dissolve slowly in the mouth. May be repeated every hour as needed or as directed by a physician. Children under 3 years of age: Consult a physician.